I received this letter Friday in response to my article and photos of Leavenworth prisoners wearing hats. What is of interest to me is Mr. Ames' hat and the ribbon. It says U.S.S. Farragut. With his conviction being in 1913, he must (assuming the picture was taken before his sentencing and not some years after) have served on the torpedo boat. Enjoy looking at the different ships; they are found by entering the ship's name, clicking on the most recent and then clicking on the link at the top to show all ships bearing the name. I love it! This is why genealogy is so fun. What other hobby or vocation bids you learn about prisons, uniforms, ships, militaries, histories (personal and macro), and photo examination, all in one afternoon? Thanks for sharing. P.S. Happy Leap Day, everyone! Our development and web operations teams are working on the problem and will have it resolved as quickly as possible. We do not currently have an estimated time that this issue will be resolved, but we will update the site as new information becomes public. The unavailability of RootsWeb may not seem related to the New Ancestry, but in a way it is. While we think of digital information, including systems like websites, lasting forever, in reality they don’t. File formats are replaced. When the software programs that read the files are gone, you’re toast. Software programs becomes obsolete. When the operating systems that run the software programs are gone, you’re toast. Operating systems become obsolete. When the hardware that runs the operating systems is gone, you’re toast. Manufacturers create incompatible hardware and stop making old models. When obsolete hardware dies, you’re toast. Since Ancestry.com hasn’t invested any money (visibly, at least), in RootsWeb in very many years, it is now a ticking time bomb. Or rather, it was a ticking time bomb. It has exploded and we wait nervously now to hear how much damage ensued. RootsWeb has been offline for more than 24 hours now. I’ve got a message in to Ancestry.com to find out if any more information is available. I’ll let you know what I find. It sounds like The Amazing Race meets Who Do You Think You Are meets AncestryDNA. Relative Race is a new family history television show, but with a twist: it’s a competition. Cameras follow four married couples as they travel across the US in search of long lost relatives, armed with only paper maps, a rental car, a $25 per diem and a flip phone. The couples embark on a journey that starts in San Francisco and ends in New York City, driving more than 4,500 miles in just ten days, stopping each day in a new city to complete a challenge, and find and stay with a newly discovered relative. At the end of each day, the team that finishes last receives a strike. After three strikes, you’re out. The remaining teams travel on towards New York City for the grand finale, where a $25,000 grand prize awaits the winning couple. As with the use of Ancestry.com in the Ancestry-sponsored Who Do You Think You Are, AncestryDNA technology plays a role in this AncestryDNA sponsored television show. You can view BYUtv through just about any media format: cable, web, smartphone, and (where I live) good old fashion rabbit ears. Except cable, all are free. Watch the official trailer on YouTube. In 2015 Ancestry enjoyed double-digit revenue growth and a net increase in the number of subscribers by 150,000. Ancestry.com signed a partnership deal in August 2015 wtih Gannett to digitize, index, and publish over 100 million newspaper pages from 80 U.S. newspapers. Publication is using technology from newspapers.com. The Cincinnati Enquirer is the first archive to be published. Worldwide, Ancestry increased the size of their workforce by 200. On the Black Friday to Cyber Monday shopping weekend, their DNA sales were up 205%. On one of those days, they sold 60,000 test kits. Do take the time at least once in a while to go visit your local libraries that have genealogy collections. You no doubt will be astounded by the treasures you will find. Here is just a summary of what is available the Louisiana Division of the New Orleans Public Library (main library downtown). There are indexes to death notices from the late 18th century up through most the latter part of the 20th century that are on 3 X 5 index cards in numerous file cabinets. There are cabinets and cabinets of microfilms of local newspapers dating back to the early 19th century. The LDS came in the 1980s and microfilmed the entire historical collection of original successions from the New Orleans municipal court. Of course there are the microfilms of Louisiana censuses (some have printed indexes, some have soundex on microfilm). Print-outs of anything on microfilm can be made. Other treasures include the photo collection (WPA, historical, 19th century prison mug shot cards, glass slides), blueprints (schools, buildings), and portfolios of actual property surveys made without the help of aerial and satellite photos. So, plan on making that visit downtown or wherever your local genealogy collection may happen to be. One trip will never be enough! Good hunting! I heartily endorse Judith. I’ve made fabulous finds in local genealogy collections as I’ve had occasion to visit towns where my ancestors lived. In one Massachusetts town the genealogy collection included registration forms for historic houses. I learned that the Insider Manson built in the 1600s still existed. What was called a mansion in those days qualified today as a small, multi-room home! The current owner let me see an original beam and original hearth brickwork. Librarians will be quick to point out that their collections often cover geographies throughout their state and beyond. At a BYU conference, Barbara Renick suggested another reason to make those visits. Some libraries offer library cards for non-residents that might give you access to research databases not available where you live. Thank you for your suggestion, Judith. Judy Russell, the Legal Genealogist, showed me something recently that led me to discover the NARA hat collection. Can anybody out there identify each hat type? Why, do you suppose, does NARA have a hat collection? How would you cite it? Ancestry sold a million DNA tests last year. This is good, because the larger the size of their DNA database, the more powerful things they can do. In 2015 they rolled out the product in the UK, Canada, and Australia. They are going to roll out a lot more countries in 2016. Ethnicity estimates will improve. Ethnicity calculations are based on a group of people whose ethnicity is thought to be accurately known. Their trees go back four generations or more and all lines are from a particular place. This group of people—a reference panel—is growing from 3,000 to 9,000 people. As the panel gets bigger and Ancestry’s data gets better, their ethnicity estimates will improve. They may change what they report about your ethnicity. A larger database also allows them to divide ethnicity regions into smaller localities. Ancestry is clustering people who share DNA. They can analyze the information from test subjects’ trees and ethnicity to see commonalities. They might be able to tell what geography the cluster originated from, or what religion they might believe in. “So imagine a time when we could actually tell John, ‘Based on your DNA, John, we think you are actually from Cork, Ireland.’ And he never even did a family tree.” That’s a direction that Ancestry is trying to go, but it’s going to take a while to develop. Kendall closed by showing us his great-grandmother, Elizabeth Jane Russell, in New Ancestry. With the new ability to show events from other family members on the timeline, Kendall noticed that she had a daughter die on the 15th of July, a son die nine days later, and another die four days after that. In two weeks’ time she lost three of her children. Kendall researched and found there had been a diphtheria epidemic. Then he noticed the next event on her timeline. She gave birth just seven months later. That child lived only two days. It is true that her person page takes more scrolling now, but that can be a good thing. There is a way to turn off the display of events from other family members for the times you don’t want them. At the top-right of the timeline, select Show and uncheck Family Events. Similarly, historical insights (or “hysterical insights,” as one person called them) can be shown or hidden. Another New Ancestry tip is the display of the tools so easily available in the old Ancestry. In the upper-right corner, select Tools, and then Show Research Tools. Kendall pointed out tutorials. There is a tutorials button that floats in the bottom-right corner of the person page. Select it to see a collection of training videos, all about a minute in length. Ancestry is expanding internationally. About a third of Americans claim German heritage. They are relaunching their German language website in a big way. They are doing television advertising in Germany for the first time. An increased involvement by users in Germany, adding content and uploading photos and things, helps everyone. They have 300 million German records and will have 400 by the end of the year. Ancestry is adding millions of German civil registration records each month. They have deals with the state archives of Berlin and Hessen, including records from East and West Prussia, Silesia, Bohemia, and Moravia. They have a German national directories project that will add 500 million records from 5.5 million images of 30,000 volumes of the German Reich from 1910 to 1955. In collaboration with FamilySearch, they are publishing Lutheran Church records. They have published 19.2 million with another 100 million on the way. They will soon publish the World War II young-men’s draft cards. They are also launching a full index of the Irish Catholic parish records. It has 10 million records from 1740 to 1900. An official announcement will be coming out in the weeks after RootsTech. It will give more details. Kendall announced that they are working on the ability to let users add additional names to the US Probate Records collection. They’ve already released that collection, which was done in collaboration with FamilySearch. It required adding a new user experience because of the packet nature of probate records. Ancestry didn’t index all individuals named in the records, so allowing users to add names and relationships will make it possible to search for, receive hints about, and attach to your tree, others in the records. “Mobile is taking over the world,” Kendall said. “At Ancestry 50% of our visitors come in on a mobile device the first time they are visiting.” Over time Ancestry has been pulling features available on the web into the mobile app. They are going to improve the search experience. They are going to provide a better way to capture content and put it online. They are adding the ability to capture audio and video capture of stories, both in the app and on the website. They will incorporate audio and video into Life Story. “Go interview people before they pass on,” Kendall recommended. Making search results and hinting (Shaky Leaf) results right is difficult. Kendall showed a diagram similar to the one I’ve put together to the right. The circle represents all the Shaky Leaves Ancestry returned about your ancestor. Some were good and some were bad. The percentage that were good is defined as precision. “Precision is finding the right stuff,” he said. The rectangle represents all the records about your ancestor. Ancestry missed some of them (the portion of the rectangle outside the circle). The percentage that Ancestry found is defined as recall. The challenge is that if you try to increase one, it makes the other worse. “[If] you cast a wide enough net [to] catch all the good fish…you’re going to bring back a lot of other weird stuff with it,” he said. For hints, Ancestry concentrates on keeping the precision high. For search, Ancestry concentrates on recall. They want you to be able to find “the needle in the haystack.” Some people are frustrated by the number of search results not about their ancestor. They want higher precision. “This is the constant challenge we’re dealing with,” he said. There is a problem with hints: users are receiving too many! It would help if they didn’t show you as many hints and if they made it easier to find the most valuable ones. They are focused on this challenge. They have a machine learned algorithm that increases both precision and recall, that anticipates where you were working in your tree, what your interests are, which hints are new, and which ones might add new information or people to your tree. Stay tuned. Next time I will cover the last part of Kendall’s presentation. Kendall Hulet is Ancestry.com’s senior vice president of product management. He spoke at a Saturday luncheon titled “Things to Look Forward to on Ancestry in 2016.” And to be clear, he was not the elephant in the room. Whoever wrote that headline was… But I digress. Kendall told us a little about the work he’s done at Ancestry. I (the Insider) was working at Ancestry when they decided to move their strategy away from One World Tree to the present way of doing things: independent trees for each user. I thought it was a big mistake and sat down with Kendall to tell him so. He assured me that he had talked to a lot of genealogists and discovered that they didn’t want to share one tree with other people. He was confident in his decision. I was not. History has proven him to be correct. At the luncheon Kendall shared a few observations that led to the decision. The first thing he observed is that users would search for the same ancestor over and over, looking for new content. The second thing he noticed is that new users always started by searching for themselves. “That didn’t work out so great,” Kendall said. “We specialize in dead people.” The last thing he saw is that the more information users added to the Ancestry relevance ranked search engine, the better their results. Kendall addressed the New Ancestry Experience. “We rolled this out after receiving lots of customer feedback,” he said. When releasing new products they get lots of user feedback along the way to guide the product. They perform alpha and beta testing. New Ancestry was a two year project. Most customers are happy with the results, although some customers are not. The intention was to allow people to better tell their families’ stories, to make their source citations better, to make the gallery easier to use, and to simplify the user experience. Stay tuned for information about Germany, new records, mobile apps, better hints, DNA, and New Ancestry. “If I had 40 minutes left to live, what would I say to this person sitting across from me?” That’s how David Isay explained the essence of a StoryCorp interview. David was a Friday keynote speaker at RootsTech 2016. David founded StoryCorps about a dozen years ago. He put a booth in Grand Central Terminal where you could bring a loved one—a parent, a grandparent, a child—or someone else you respect. The StoryCorps facilitator sits the two of you in the booth, opposite one another. For 40 minutes you pose questions to your loved one and listen to the answers. At the end of the 40 minutes, one copy of the recording goes home with you, and a second copy is preserved at the American Folk Life Center at the Library of Congress. Your great-great-great-great-grandchildren will be able to learn about your grandmother, hearing her own words and in her own voice. So far, 65,000 interviews have been archived. “It is the largest collection of human voice ever gathered,” David said. Weekly, millions of listeners experience a few of these stories on NPR’s Morning Edition. David said that the setting gives you license to say things you don’t normally get to say. “A lot of tissue gets used up in the booth,” he told us. David shared clips from several examples. It was true. A lot of tissues were used (or at least needed) in the audience. “Because of the nature of what happens in the StoryCorp booth, I feel like we’re collecting the wisdom of humanity,” David told us. Wil had just been diagnosed with cancer at the time of the interview and has since passed away. The StoryCorps website has what David called a question generator, where you can find questions that, in their experience, lead to successful interviews. I thought perhaps any of us could utilize it for doing our own interviewing. You could use the FamilySearch Memories app to save the recording on FamilySearch.org. Or you could utilize upcoming features of Ancestry.com. Or do a video interview. Later, David told us about the StoryCorps app. It is available from the Apple App Store and Google Play. If you go with StoryCorp, you can have the recording sent to the Library of Congress and shared online with the world. To learn more about StoryCorp, visit www.StoryCorp.org. To watch David’s keynote on YouTube, visit www.youtube.com/watch?v=YOeG0V6BbfE. The first Friday keynote was presented by husband and wife team, Josh and Naomi Davis. Naomi Davis, known by millions of readers online as “Taza,” started her blog Love Taza in 2007, writing about their newlywed life in New York City while finishing her BFA at the Juilliard School. The blog started as her digital diary. Naomi and Josh told attendees that each of us has a story. Inspiring stories are not just from the past; they are happening today. If we share our stories with the world, we will uplift others and others will uplift us. A recording of Josh and Naomi’s presentation was not made available. To read some articles about it, see the FamilySearch Blog, the Deseret News, ksl.com., and Bernice Bennett’s YouTube interview. RootsTech announced that registrations had exceeded 26,000 from a record 37 countries, including Myanmar and Afghanistan. RootsTech also announced the results of Thursday night’s Freedmen’s Bureau Index-A-Thon. The event’s goal was to index 900 batches in 90 minutes. In the end, a total of 1,937 batches were indexed! These records are not easy to index, so congratulations to all who participated! Huzzah! Friday Findmypast made an announcement during the keynote session. Findmypast and FamilySearch are collaborating to publish the most comprehensive collection of U.S. marriages available online. They will cover 2,800 counties and go back as far as 1650. When completed, the collection will contain 100 million records and more than 450 million names. Findmypast has launched the collection with 33 million records. I didn’t catch a timeline for when the remaining 67 million will be complete. The collection is free from now until Valentine’s Day. “You can’t understand the Biblical story, I’ve come to realize, without understanding the desert,” said Bruce Feiler. Bruce was one of the Thursday morning keynote presenters at RootsTech 2016. Bruce Feiler is a New York Times best-selling author, columnist, and frequent contributor to NPR, CNN, MSNBC, and Fox News. His most recent book is The Secrets of Happy Families. “The greatest breakthroughs [of people in the Bible] occur, not when they are comfortable, not in the best of times, but when they are in the wilderness, in the worst of times,” he said. The writers of the Bible elected to include the stories of hard times and we should do the same. Bruce characterized family stories into three types. Ascending: He came to America with nothing, worked hard, and became successful. Descending: He was well off, the stock market crashed, and he lost everything. Oscillating: Things were good. They went bad. She overcame and things were good again. It made me think of a two minute video from RootsTech 2014. Watch it with Bruce’s words in mind. I wanted to drop you this private note (although, all things considered, it may not be so private). I just wanted to remind you of the final day of live streaming from RootsTech. Streaming begins at 8:30 am MST (10:30 EST, 7:30 PST). Find download links for the syllabi on the Ancestry Insider website. Today is also Family Discovery Day for members of The Church of Jesus Christ of Latter-day Saints. Live streaming begins at 1:00 pm MST (3:00 EST, 12:00 PST). 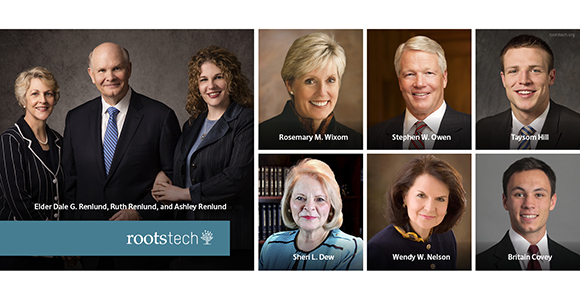 Look for further RootsTech reports next week, starting Tuesday. Have a great weekend! I suppose hog aficionados knew exactly what they were hearing the moment the growl roared from the back of the cavernous convention hall. A large Harley came rumbling down the aisle and up onto the stage. A rather large, scruffy looking biker dismounted and took the mic. Every American Ride aficionado knew exactly who they were listening to: Stan Ellsworth, the biker turned history teacher, host of a BYUtv television show. “Maybe your family’s like mine and came over in the 1600s,” he said. Or maybe your family came in the 1700s and gave their blood to create this nation. Or maybe your family came from China and helped build the west. He went on to mention a dozen other immigration scenarios. At half-past the hour (7:30 pm MST), about 10 minutes from now, you are invited to participate in the Freemen’s Bureau Project Index-A-Thon. The goal is to do 900 batches in 90 minutes. While this is happening live at RootsTech (in the computer labs), you can help out wherever you are at! Visit http://Facebook.com/DiscoverFreedmen and the project website at http://www.discoverfreedmen.org.